The municipality Wüstenrot, near Stuttgart in Germany, has the ambitious plan to become energy independent by 2020 and to cover its whole energy demand (thermal and electricity) with renewable energy. Several technical implementations towards realising this goal have already been taken over the past few years, including energy efficiency measures on the buildings and infrastructure and the implementation of biomass heating plants, geothermal heat pumps, PV-systems for electricity generation and solar thermal systems for heating an energy supply. For the Sim4Blocks project, three use cases will be implemented and studied. The first use case focuses on the implementation of demand response (DR) by an electrical flow type heater with 150 kW to transfer electrical power into heating energy (power to heat) to be used in a 300 kW biomass and solar thermal driven heating grid. The heating grid supplies five detached residential buildings (75 kW) and a group of public buildings (city hall, communal building yard, fire brigade and the German red cross; together totalling 225 kW). To increase the operation time of the power to heat system, both the 9 m³ hot water storage and also the thermal mass of the public buildings are actively used by increasing the room air temperature within the comfort range. The residential buildings will be equipped with smart meters and simplified user interfaces to get a stronger user involvement. 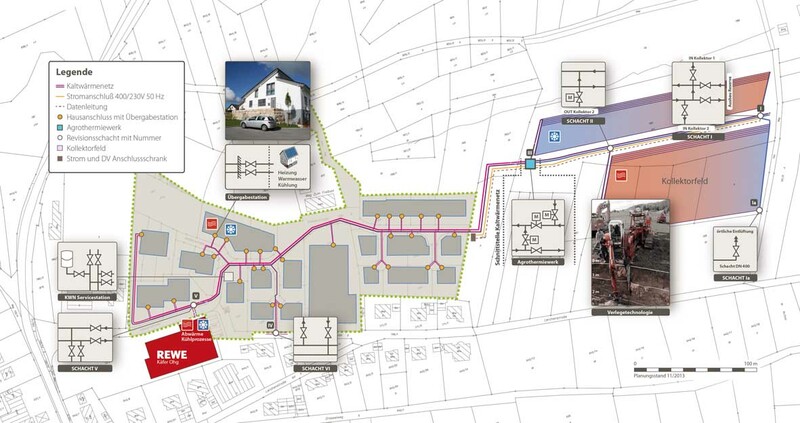 The second use case addresses DR for the existing innovative plus energy district “Vordere Viehweide”. This district comprises of 16 newly built and highly energy efficient residential buildings. The net zero energy supply concept combines low-depth geothermal systems, heat-pumps and large photovoltaic (PV) systems. The low temperature energy source of the heat pumps is the central cold water heating grid which is connected to a large, innovative near-surface geothermal system. An intelligent load and storage management system in the buildings helps to increase the PV self-consumption and to reduce peak power feed in on a building level. The existing connection to a virtual power plant offers a negative controlling power range to the transmission grid for the whole cluster of buildings. A cloud-based data management system with weather forecast data and predictive simulation tools will be used for the evaluation of externally usable loads, their timely availability and their clustering for the whole district. The requested demand-respond load profile for the whole district is then transformed into single load profiles for each building. The local controllers operate the heat pumps and electrical storages according to these load profiles. The third use case at Wüstenrot addresses the management of blocks of buildings on a municipality level. In contrary to the other two use cases, here the behaviour of the electrical grid on the municipality level will be analysed. To dynamically shift loads within the electrical grid and to exploit the potential of DR in Wüstenrot, the transformer stations will be continuously monitored and integrated into a central database. The 3D-City model of Wüstenrot will be used to predict the solar PV generation for the different lower voltage distribution grid sections. Depending on the status of the grid sections and the predicted day ahead profiles, the ESCO SSH will develop optimum schedules and pricing models to motivate users to adapt their electricity use to the renewable energy generation and to the needs of the grid. Within this use case a larger number of buildings will be equipped with smart meters and user interfaces to provide relevant information to the residential and commercial users. The plan is to motivate selected commercial users with a high potential for load shifting to install active DSM control systems. The infrastructure of Wüstenrot, especially the fresh water supply and for some the sewage water treatment, offers possibilities for load shifting. These systems (pumps of fresh water storages and of sewage water treatment) will be equipped with active control systems for DSM.